The Alternative Investment Fund Managers Directive (AIFMD) went live in July 2013 and has a significant impact on how managers operate their business and pay their staff, from capital requirements and remuneration to leverage, valuation and marketing. AIFMD transitional periods expired in July 2014, with AIFMD regulatory reporting deadlines for most regions, including Ireland, Luxembourg and the UK, beginning on 1 January 2015. EU managers with AuM that fall below a deminimus threshold of €100mn, or €500mn with a five year lock-up, do not require authorization but must still register. Non-EU managers that wish to begin or continue marketing to EU investors must be compliant via a ManCo or the relevant private placement regime(s). 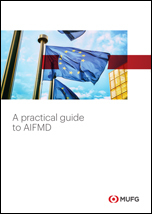 For a practical guide on the AIFMD and its requirements, please click here. How can MUFG Investor Services help? MUFG has an Annex IV reporting solution in partnership with a partner, which pulls information from our accounting systems and the manager to format, calculate and submit the required information. MUFG has a fully licensed depositary bank in Luxembourg, which can offer depositary or depositary-lite services from Luxembourg or through our Dublin branch. MUFG offers a contractual service as external valuer subject to asset type, the implementation of valuation policy, and audit trail and compliance reports. If a manager wants to market into the EU but cannot or does not want to act as the AIFM of its Alternative Investment Fund or the UCITS Management Company of its UCITS Fund – MUFG offers an alternative to the huge investment and long process of creating your own dedicated internal Management Company. Utilising our Luxembourg Super ManCo, MUFG provides you with an efficient and flexible solution, underpinned by strong corporate governance. Being the sponsor of your fund you will be able to act as Investment Manager, Investment Advisor and Distributor of your fund. Click here for more information on our AIFMD ManCo Service. Custom reports for different member state requirements are available, along with calculations and information aggregation and XML filing with regulators. For further information about our AIFMD offering, including a full breakdown of the various private placement markets and how they will be affected, please contact MUFG Investor Services.